When it comes to hydrating facial skin, along with delivering nutrients to it, ready-made "sheet masks" have become quite popular. Neutrogena is now taking the concept further – its MaskiD system fabricates 3D-printed masks that are customized to the shape and needs of each client's face. (The Conversation) Despite fears that guns made with 3D printers will let criminals and terrorists easily make untraceable, undetectable plastic weapons at home, my own experience with 3D manufacturing quality control suggests that, at least for now, 3D-printed firearms may pose as much, or maybe even more, of a threat to the people who try to make and use them. Many consumer 3D printers experience a variety of glitches, causing defects in the items they make. At times, an object detaches from the platform it’s on while being made, ending up lopsided, broken or otherwise damaged. Flaws can be much harder to detect when the flow of filament – the melted plastic material the item is being made from – is too hot or cold or too fast or slow, or stops when it shouldn’t. Even with all of the settings right, sometimes 3D-printed objects still have defects. A company called Defense Distributed developed a 3D-printed gun called the Liberator, which many fear could pass through security checkpoints undetected. Rather than building up plastic filaments layer by layer, a new approach to 3-D printing lifts complex shapes from a vat of liquid at up to 100 times faster than conventional 3-D printing processes, University of Michigan researchers have shown. 3-D printing could change the game for relatively small manufacturing jobs, producing fewer than 10,000 identical items, because it would mean that the objects could be made without the need for a mold costing upwards of $10,000. But the most familiar form of 3-D printing, which is sort of like building 3-D objects with a series of 1D lines, hasn't been able to fill that gap on typical production timescales of a week or two. "Using conventional approaches, that's not really attainable unless you have hundreds of machines," said Timothy Scott, U-M associate professor of chemical engineering who co-led the development of the new 3-D printing approach with Mark Burns, the T.C. Chang Professor of Engineering at U-M.
(The Verge) America’s busiest spaceport in Cape Canaveral, Florida, is about to get a new tenant: a startup that shares SpaceX’s ambitious plans of turning humans into a multiplanetary species. The new occupant is LA-based launch provider Relativity Space, a company that wants to revolutionize how rockets are manufactured through the use of fully automated 3D printing. The company will soon have its very own launch site at the Cape for its future 3D-printed vehicles. …Relativity’s goal is to disrupt the entire process of manufacturing rockets. “For the last 60 years, the way rockets have been built hasn’t really changed,” says Ellis. Instead of relying on the traditional, complicated assembly line of machines and people sculpting and piecing together parts of a vehicle, Relativity wants to make building a rocket almost entirely automated. The trick? Using giant 3D printers that can create all of the parts needed to build a rocket — from the engines to the propellant tanks and structure. 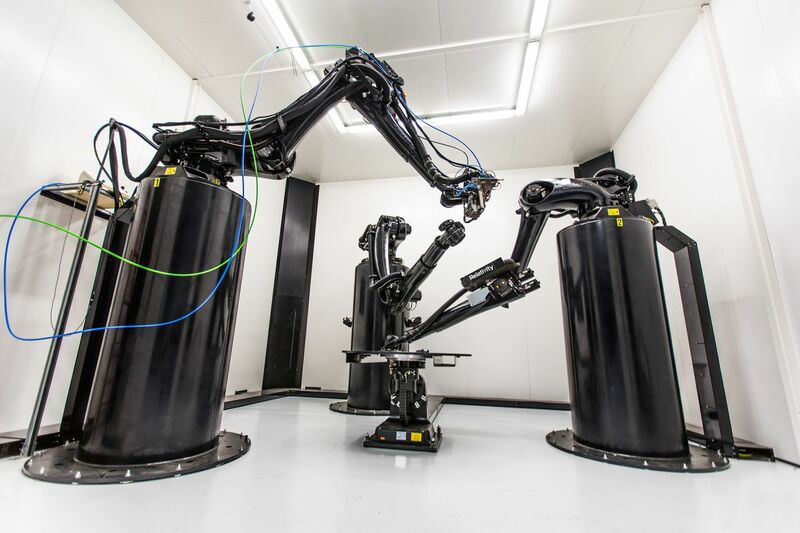 At the company’s Los Angeles headquarters, Relativity has the largest metal 3D printer by volume, a machine that’s capable of creating parts that are up to 20 feet tall and 10 feet wide. It’s called Stargate, another nod to Starcraft, and the team designed this printer from scratch, which means they can scale it up if needed. Ellis says that by relying on printers like this for manufacturing, the team will be able to produce about 95 percent of the rocket through 3D-printed automation. The last 5 percent still requires human labor. Most of that human interaction will be centered on testing, shipping, and very small amounts of manual assembly. Relativity’s Stargate 3D printer at the company’s LA headquarters. (Nature) Atomic-scale mechanisms that affect the structural properties of materials can also inform the design of new materials needed for engineering, such as high-performance alloys. In a paper in Nature, Pham et al. report their use of 3D printing to translate some atomic-level hardening mechanisms typically found in crystalline materials to a larger scale. 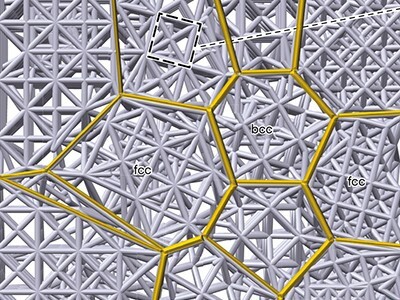 The resulting ‘architected’ materials contain substructures that are designed to mimic atomic arrangements in crystal lattices. Their work provides a fresh approach for developing designer materials and could facilitate the application of hardening mechanisms to different materials and on different scales. The Researchers from "NOWLAB" developed the world’s first fully 3D printed e-Motorcycle which is functional. The 3D printed e-bike is named as NERA. It has the groundBreaking features like, airless tires, embedded electronics, and forkless steering. Almost all the parts of NERA except the electrical components are created using 3D Printing. (Discover) Last week, Northrop Grumman’s Cygnus spacecraft departed the International Space Station, having delivered a batch of new experiments and cargo. Among them was the Refabricator, a new machine that will not only make objects on demand things for the astronauts, it will recycle them too. While 3-D printers are becoming commonplace, nowhere are their benefits more obvious than in the confines of space. The Refabricator can recycle plastic and 3-D print it, all within a box the size of a mini-refrigerator. Successful applications have come despite the fact that most 3-D printing techniques can only produce parts made of one material at a time. More complex applications could be developed if 3-D printers could use different materials and create multi-material parts. New research uses different wavelengths of light to achieve this complexity. Scientists at the University of Wisconsin-Madison developed a novel 3-D printer that uses patterns of visible and ultraviolet light to dictate which of two monomers are polymerized to form a solid material. Different patterns of light provide the spatial control necessary to yield multi-material parts. The work was published Feb. 15 in the journal Nature Communications. 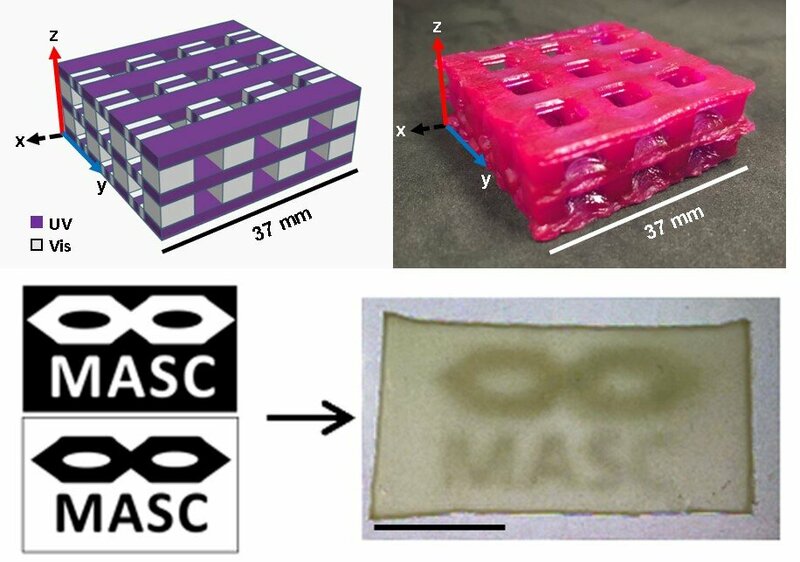 Four-dimensional (4-D) printing can create complex 3-D geometries that react to environmental stimuli, opening new design opportunities in materials science. A vast majority of 4-D printing approaches use polymer materials, which limit the operational temperature during the process of engineering. In a recent study, Xiaolong Chen and co-workers at the Dyson School of Design and Engineering, Department of Earth Science and Engineering and Department of Materials at the Imperial College of London, U.K., developed a new multi-metal electrochemical 3-D printer. The device was able to construct bimetallic geometries by selectively depositing different metals with temperature-responsive behavior programmed into the printed structure. 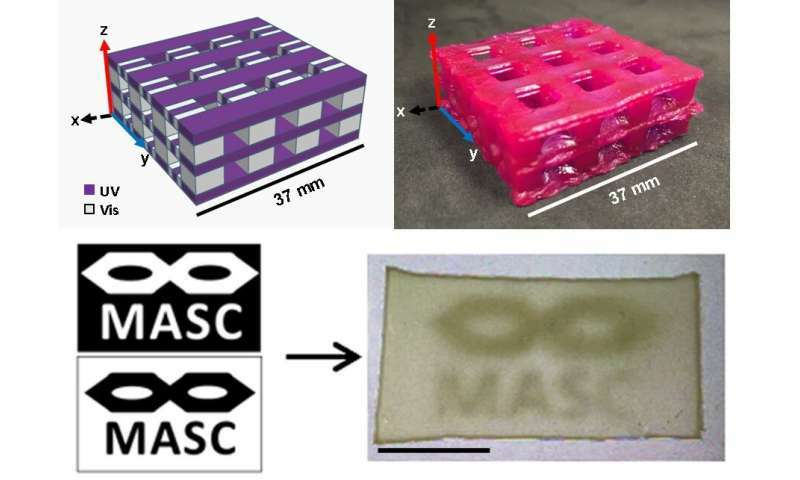 In the study, they demonstrated a meniscus confined electrochemical 3-D printing approach using a multi-print head design and nickel and copper materials as examples, the ability can be transferred to other deposition solutions. The results are now published in Scientific Reports. 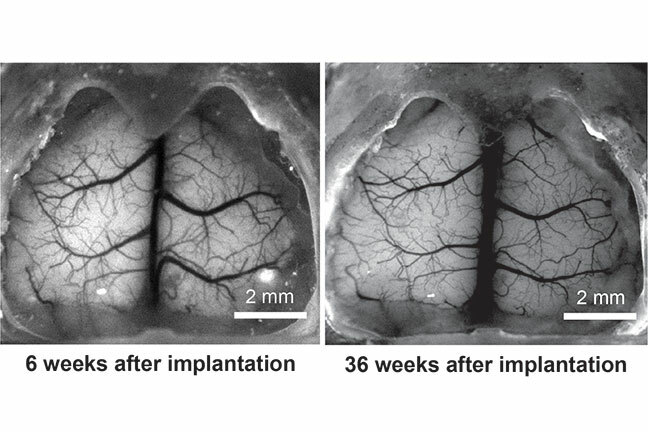 "This is the first time anyone anywhere has successfully engineered and printed an entire heart replete with cells, blood vessels, ventricles and chambers," says Prof. Tal Dvir of TAU.